This was the view when I came out of my bedroom this morning. I know, silly. But it didn't look real to me; more like a painting, so I just had to take a photo. 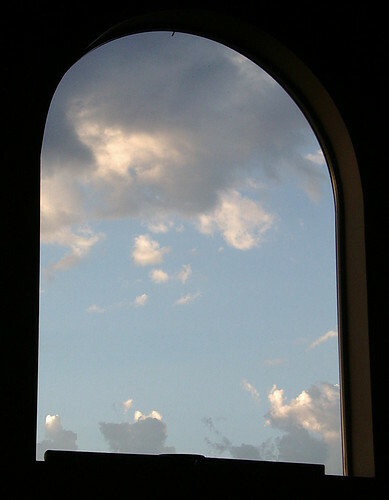 This is the arched window in my family room, the window is on the second story of the back of the house. I love looking at it from the bedroom, family room and foyer because all you can see are the heavens -- sort of peaceful. If you are on the top of the landing looking out, you can see the whole valley around us. Fun the two views from one window. All I can is beautiful!! Enjoy this wonderful view.